Here is a pocket card and a 3 X 6 card that I made on Saturday. They should have been made on Sept. 15 of 2007, since that was the day I was at my upline meeting. But, hey, I found these while I was unpacking and decided to finish them up. I can tell you the colors are really rust, chocolate chip, sage shadow, sahara sand, and very vanilla. The inks are the same, excluding the sage and vanilla. The stamp sets were Wanted, Sanded and Fundamental Phrases. I really loved the medallion that we made on the wanted card, so I made a tutorial for ya! Check back in a bit for that. It's lunch time here, so I want to feed my boys and get it on during their nap. Have fun and happy stamping!! Wow! I love these Julie--great masculine themes and colors and beautiful layouts too! Cute, cute. 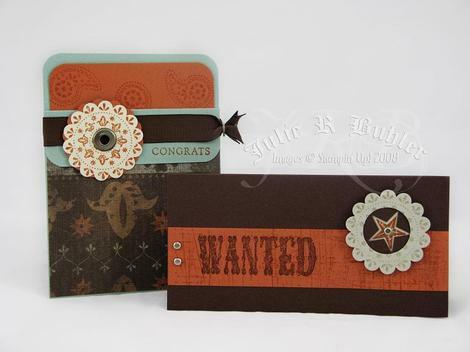 Thanks for sharing - I think we all always need more ideas for masculine cards - love that medallion too! Glad you found these cards. Love 'em. These are great cards!!! This is one of my favorite sets!! GREAT job!! !